Have you ever thought of learning guitar, but never found any easy way to do so? Well now learning guitar is very easy with the help of this book. 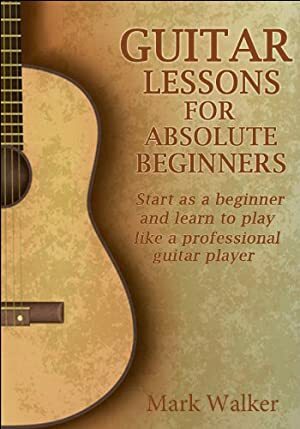 Guitar lessons for absolute beginners is a step by step easy guide, which will teach you how to play guitar. All necessary information about guitar is covered in brief in this book. With help of this book, you can learn guitar at the comfort of your home. Any person with absolute no knowledge of guitar can easily learn to play guitar with the help of this book! • To the point explanations, no extra writing. • Images are included wherever required. • Four levels of guitar picking lessons. • Four levels of guitar fretting lessons. • Quality book at low price. Introduction: Guitar lessons for absolute beginners. • Guitar picking lessons: Level-1, Level-2, Level-3 and Level-4. • Guitar fretting lessons: Level-1, Level-2, Level-3 and Level-4. So what are you waiting for? Get your copy now! Track It. This book reaches FREE about 5 times a year. Log In to track Mark Walker on eReaderIQ. to be notified each time the price drops on any book by Mark Walker. to stop tracking Mark Walker. We started tracking this book on March 20, 2014. The price of this book has changed 106 times in the past 1,860 days. The current price of this book is $2.99 last checked 23 hours ago. The lowest price to date was FREE last reached on April 14, 2019. This book has been FREE 30 times since we started tracking it. The highest price to date was $2.99 last reached on April 15, 2019. This book has been $2.99 52 times since we started tracking it. We last verified the price of this book about 23 hours ago. At that time, the price was $2.99. This price is subject to change. The price displayed on the Amazon.com website at the time of purchase is the price you will pay for this book. Please confirm the price before making any purchases.